A view of the city with condos and new housing going up. The real estate industry of the northern province of Chiang Mai saw a slower growth in the first three month of 2014. 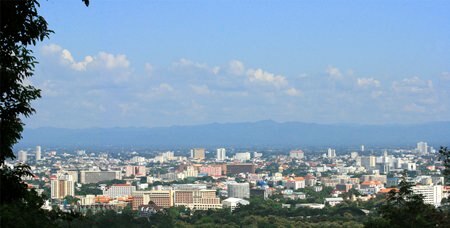 In a seminar on the situation of the housing industry in the North, the Government Housing Bank’s Real Estate Information Center unveiled that Chiang Mai has seen a slowdown since the last quarter of 2013 all through the first quarter this year. Actually, the overall housing market in Thailand has been badly affected by political confrontations between the government and its opponent, the People’s Democracy Reform. The Thai Industries Sentiment Index (TISI) in March plunged to its lowest point in 57 months following concerns over political uncertainty, while domestic sales of automobiles in the first three months of 2014 have dropped 45.8 per cent due to the end of the government’s First Car Buyer Scheme. Federation of Thai Industries (FTI) chairman Supant Monkolsuthree said that a survey of 1,107 firms from 42 industrial clusters indicated that last month’s TISI plunged to 84.7, one point down from 85.7 in February, to its lowest in almost five years due to reduced domestic consumption as a result of prolonged political instabilities. Mr. Supant noted that decreased domestic consumption has led to declining sales and orders. Operators are unable to readjust the prices of products despite the increased cost of production. Escalating political turmoil may further affect the country’s competitiveness in the long run and the country’s preparation for initiation of the ASEAN Economic Community by the end of 2015. The new FTI chairman advised the government to introduce measures to boost the country’s dampened economy. However, Mr. Supant said that the TISI forecast in the three month period will rise from 98.4 in February to 99.1 following an increase in orders, sales, production and output. Meanwhile, sales of cars in the first three month of 2014 fell by 45.8 per cent year-on-year to 224,171 units, while sales of motorcycles fell 21.35 per cent to 431,795 units. However, exports of motorcycles increased 1.25 per cent at 291,509 units, with an export value of more than Bt100 billion, a rise of 7.43 per cent. The export value of cars and motorcycles in Q1 was Bt215.4 billion, up 9 per cent. The country produced total of 205,041 in the first three months of 2014, a year-on-year decrease of 28.28 per cent. The Software Industry Promotion Agency (SIPA) has decided to invest 137 million baht to prepare Thai software operators for the upcoming ASEAN Economic Community (AEC) in 2015. SIPA director Trairat Chatkaew said the government has put a lot of emphasis in the technology sector by approving SIPA to invest at least 137 million baht. Following this procedure, SIPA hopes to develop greater software tools to help business operators across all industries save costs in their production line. SIPA will mainly focus on improving employees’ overall abilities to meet AEC standards in order to raise the bar of standardized Thai software operators. The goal is to get at least 1,000 qualified Thai software operators to be accepted in the international market, as Thai operators in the past have had a weak foundation. To resolve this problem, SIPA has founded the “tycoon chic” project, which is designed for business owners in the software industry. Under this project, companies will learn to grow strong and firm, attract investors into the intellectual property rights businesses, and be aware about future technology trends in the next couple of years. While there is a stereotype about expats usually being single men (e.g. older unmarried males who then marry much younger local spouses) or married couples where the husband (as the primary breadwinner) has been deployed abroad by his employer, women of all ages and marital statuses are increasingly choosing the expat life. This is the first part of a two part series on financial issues expat women face. Depending on whether or not you are a single or a married expat woman who is still working or retired, you will need to consider or be aware of the following special situations or issues and how they can impact you as an expat women. While there are no statistics available about how many expat couples get divorced or separate while abroad, there is both strong anecdotal and statistical evidence to suggest expat divorce is on the rise e.g. the Telegraph has recently reported that in 2011, 445 expatriate couples living in Dubai ended their marriages there while a Sunday Times article (posted on a forum here) has detailed the struggles along with some horror stories about expat women who have gone through messy divorces in Singapore. Moreover, expat divorces are very tricky due to potential inter-jurisdictional issues and it’s often the male expat spouse who has the upper hand – especially if the expat woman is living in a foreign country on some sort of dependent pass which can often be canceled very quickly by an estranged husband or his employer. With that in mind and unless your spouse has citizenship that differs from yours or if you and/or your spouse own some kind of business or have significant assets in a foreign country, it makes the most sense to file for divorce in your home country, state or province and be subject to your own laws (which probably will tend to favor a non-working spouse and often wives if you are from a Western country). However, be aware that if you file for divorce in your home country, any type of financial or child custody judgment could be difficult to enforce in a foreign jurisdiction as not all countries allow legal or financial judgments from another country to be carried out on their soil. The best way for an expat woman to protect herself and ensure a fair share of any communal assets along with alimony or child support payments would be to make sure there is some sort of pre-nuptial agreement in place before going abroad. Just be aware that if someone files for divorce outside of the country where the pre-nuptial was signed, any terms in the agreement that conflict with a host country’s laws (e.g. Muslim countries like the UAE where there are strict Shari laws or laws related to morals) may not be legally binding or enforceable. In other words, you will need to seek out the advice of an experienced divorce attorney who specializes in international family law and has handled expat divorce cases should irreconcilable differences develop in your marriage abroad. Estate planning can be a sensitive topic because it deals with death. But if you are a married woman thinking of retiring abroad with your husband, it’s important to remember that (statistically speaking) you will outlive the average man by several years. In fact, a 65-year old woman should expect to live until her mid-eighties and many can also expect to live well into their nineties – usually without their husband. Will. A legal document that will direct the distribution of your estate as well as name legal guardians for any minor children, wills can still be contested and must go through probate. However, you will at least ensure some bare legal protections and have a say in what happens with your estate. Living Trust. A legal arrangement made during your lifetime for the purposes of managing assets, living trusts will avoid probate and can shield the assets in them from estate taxes. Moreover, you will retain complete control over the trust whose terms can be kept confidential. Durable Power of Attorney. Should you become incapacitated, a durable power of attorney will give a legal representative of your choosing the right to make financial decisions on your behalf. Health Care Proxy. Should you become incapacitated, a health care proxy will give a legal representative of your choosing the right to make health care decisions on your behalf. If you are a retired expat woman who is single, the last two items will tend to be your most important considerations or priorities because without them, the closest living blood relative will generally be chosen by legal authorities to make decisions on your behalf. This means you will need to ensure that something written is in place and that all of the necessary documents are easily accessible to relevant parties in an emergency situation to ensure that your wishes are carried out in the event you become incapacitated. And while most of your liquid and financial assets will likely be in the country where you have citizenship, be sure to check the laws of the country you are expatriated in, especially if you own property or a business or maintain large local bank accounts there. More than likely, estate and probate laws are going to be different and you will need to check with a local attorney to see whether any of the above mentioned estate planning items that you may already have in place is actually enforceable outside of your home country and where you currently reside.